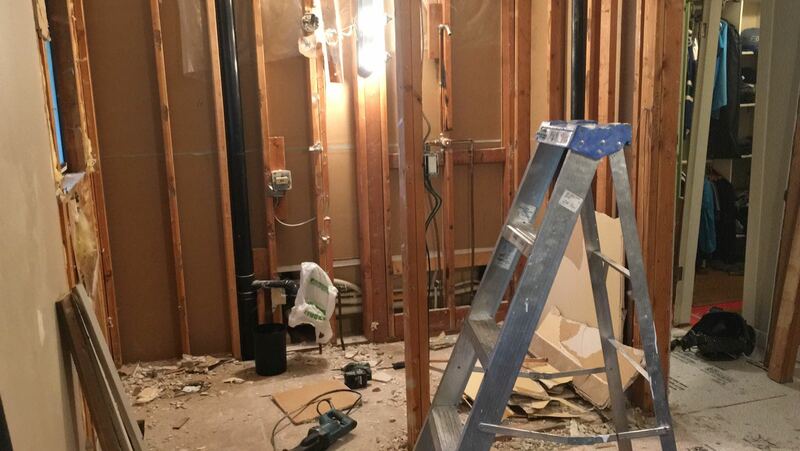 Have you ever experienced the equal parts of joy and terror that come with starting a renovation project? The thrill of the sledgehammer demolishing that ugly, leaky, old shower and the sleepless nights of wondering if you can actually put this thing back together. The excitement of picking out new fixtures and the horror of hearing a toilet flushing after you’ve cut away the drain. The feeling of accomplishment as you check tasks of the list and the sinking feeling you’ll never get your house clean again… seriously, living in the same space you’re renovating is the worst! This summer I set out to renovate our Master bathroom and bedroom - it was a project that was not for the faint of heart. You see, it wasn’t just a new coat of paint but a full, “to the studs”, gut job. It took most of summer to complete. Actually, if I’m honest, I still have some finishing touches left before its really done but I figure once you are nailing up the crown molding and touching up nail holes, you’re basically done, right?!? As I have tried to live out this advice I’ve realized how hard it is for me to give myself time. Grace and truth seem much easier for me than patience. I want it to be finished. As I find my frustration building about why this project is taking so long, I come back to Jesus and thank him for his grace, his truth and especially his time. I hope in the midst of the ever-present construction dust in our lives, perhaps you, too, can take a break from renovating to sit back on the porch with Jesus and enjoy the final days of summer.